JAKARTA (Reuters) - In April 2013, a Lion Air Boeing 737 missed the runway on the Indonesian resort island of Bali in bad weather and plowed into the sea, cracking its fuselage open on the rocks. All 108 on board survived. But a September 2014 report by Indonesia's air crash investigators highlighted errors and poor training, saying the 24-year-old co-pilot had failed to adhere to the "basic principles of jet aircraft flying." Lion Air, struggling to get off a European Union blacklist because of "unaddressed safety concerns," asked Airbus, which supplies part of its fleet, to help improve training. The EU removed the privately owned budget airline from the list in 2016 after it determined Lion Air met international safety standards. None of Indonesia's roughly 100 airlines - most of them tiny - remain on the EU blacklist, with the last few coming off in June. All were banned in 2007; the national carrier, Garuda Indonesia, was the first to be removed in 2009. The crash of a Lion Air jet on Oct. 29 into the sea off Jakarta has put a spotlight back on the airline's safety record, although the cause remains undetermined. None of the aircraft's 189 passengers and crew survived. Lion Air's latest crisis illustrates the challenge relatively new carriers face as they try to keep pace with unstoppable demand for air travel in developing nations while striving for standards that mature markets took decades to reach. "I know Garuda," he said of the national carrier. "The other airlines, I don't believe they do the maintenance and training properly.” He declined to elaborate further. Lion Air Managing Director Daniel Putut disputed any laxity in the airline's safety culture, stressing that it conducted maintenance in accordance with manufacturer guidelines. Putut, a former pilot, also told Reuters during a visit to the airline's training center near the Jakarta airport that it complied with all regulatory requirements. He said Lion Air had worked hard to install an attitude of "zero tolerance" for accidents after the Bali crash, making last week's disaster a painful eye-opener. Thousands of Lion Air flights have taken off and landed without serious incident since then. "We are also looking into what went wrong - new aircraft, experienced crews, and we have applied the zero-tolerance culture, yet another accident happened," Putut said. "But we still don't know the cause, so we will wait for the investigation from NTSC (National Transportation Safety Committee)." Frank Caron, head of a risk consulting firm who served as Lion Air's safety manager from 2009 to 2011 after insurance companies requested a foreign expert, said that at the time he was troubled by what he regarded as the airline's attitude that accidents were inevitable. "Safety is much more than running concepts and procedures," he said. "Safety is a spirit, a state of mind, a way of thinking, an attitude in the daily aspects of an operational life. And that is precisely what Lion never got. They would say, 'The airline has 250 flights a day, it is not abnormal that you have accidents.'" For example, after the 2013 Bali crash, Lion Air co-founder Rusdi Kirana told local media who asked about the airline's safety record: "If we are seen to have many accidents, it's because of our frequency of flights." Caron claimed he left Lion Air after some of his safety recommendations were not implemented. Lion Air's chief executive declined to comment on Caron's account of his departure or his other assertions. Indonesian accident investigators made four recommendations after the Bali crash, including that Lion Air should "ensure that all pilots must be competent in hand flying" and teach proper cockpit coordination. Between the Bali crash and the one last week, Lion Air had three non-fatal accidents, including one in April in which a 737 skidded off a runway, according to Flight Safety Foundation's Aviation Safety Network database. During the same period, five jets from its chief rival, the national carrier Garuda Indonesia , were damaged beyond repair, and two accidents killed a combined 22 people, according to the database. Garuda declined to comment about its safety record. 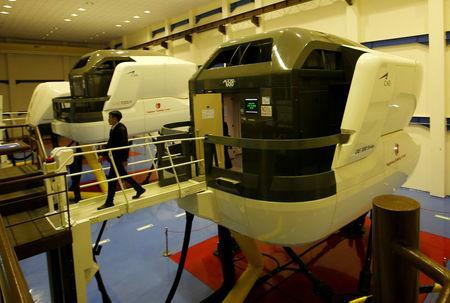 EASA certifies its training center to instruct other airlines' pilots on A320 simulators and is seeking the same approvals for 737 jets and ATR72 turboprops, said Andy L Punuh, Lion Air's Angkasa Pilot Training Organisation Director. With 129 million passengers in 2017, the Southeast Asian country was already the world's 10th-largest aviation market and is projected to continue growing. That growth has been accompanied by an air-accident rate that was twice the global average in 2017 and consistently higher than Indonesia’s neighbors in the Association of Southeast Asian Nations, according to the United Nations' aviation agency. The Federal Aviation Administration later issued a directive calling for revisions to "operating procedures of the airplane flight manual." "The European Commission continues to monitor the situation on a regular basis," he said. "It is still too early to have any conclusive views on the causes of the accident."